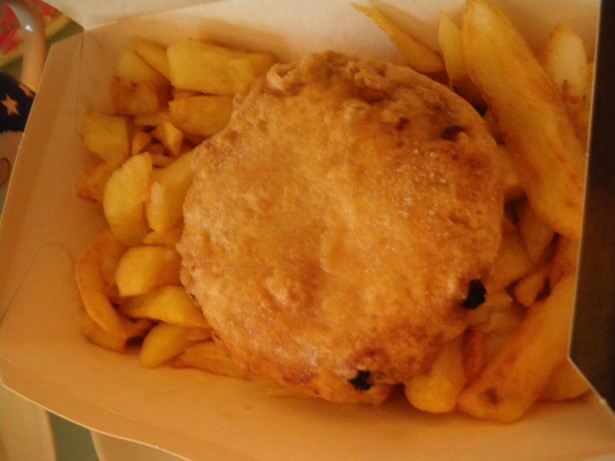 A Northern Irish pastie supper bought in Bangor, County Down. Friday’s Featured Food! Today’s Friday’s Featured Food is a personal favourite of mine as it’s from my home country – the Northern Irish pastie supper. From my experience most travellers forget Northern Ireland exists, some even forget that it’s on the island of Ireland and most travellers head straight to Dublin when they book a flight to the island of Ireland. However the best part of Ireland to see is definitely Northern Ireland, with Belfast being a key city, as the country’s capital and a city steeped deep in history and culture. History lesson over, now you tell me what on earth is a “pastie supper”!! 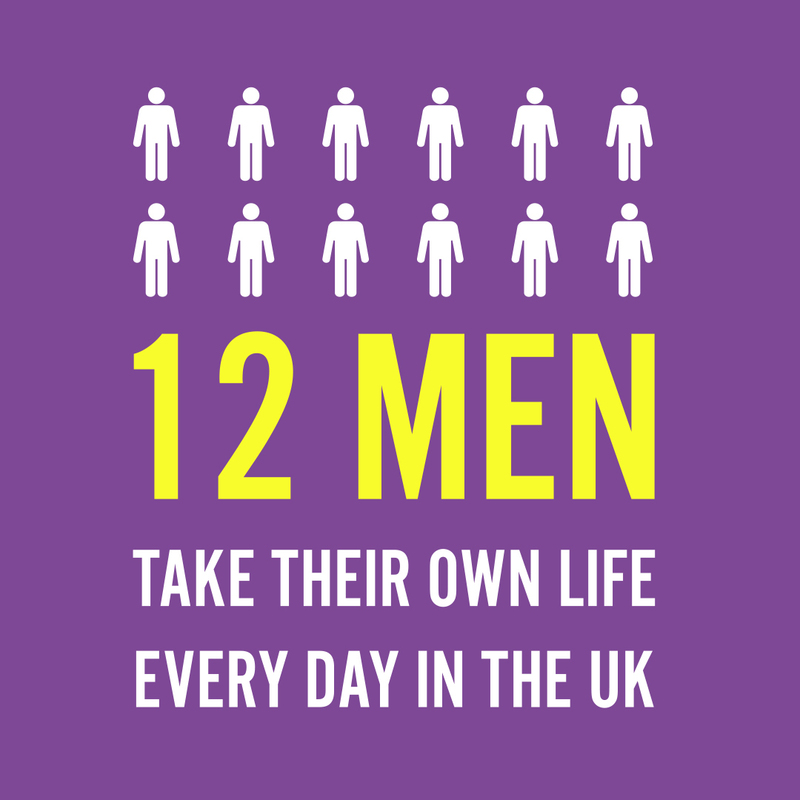 And why it’s a Northern Irish phenomenon. 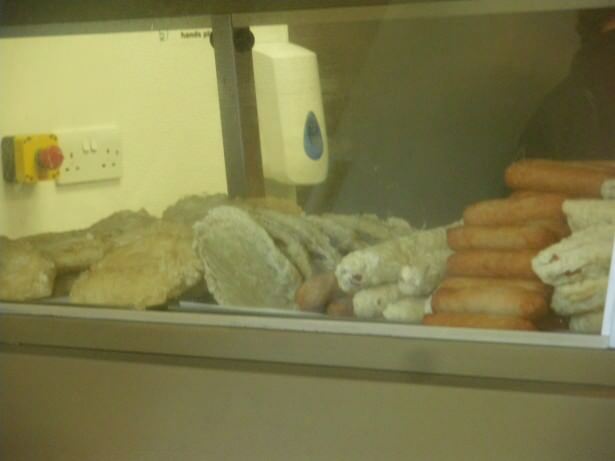 A typical Northern Irish takeaway place like this will always serve you a pastie supper. This is Wee Gees in Bangor! By its very definition it’s obviously some sort of pastie to be consumed at supper time. Spot on, or “dead on” as the Northern Irish would say. 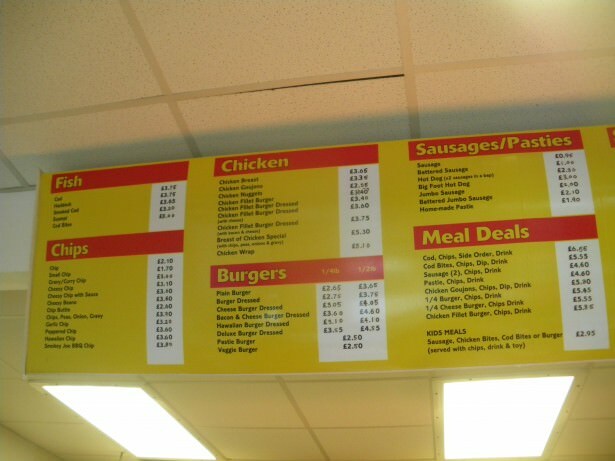 Pastie Suppers are almost exclusively Northern Irish (though some variants undoubtedly appear in Scotland, Northern England, Cornwall and the Republic of Ireland). 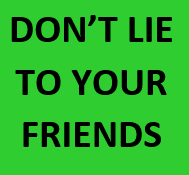 They are also for consumption mostly at supper time. It is not a normal breakfast or lunchtime item. 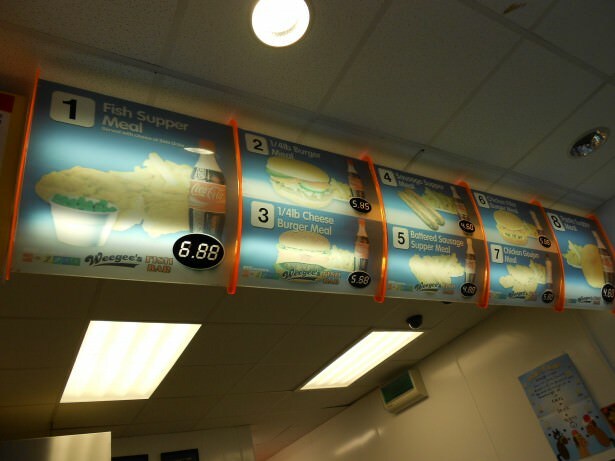 At dinner time or supper time pastie supper s are popular across Northern Ireland. 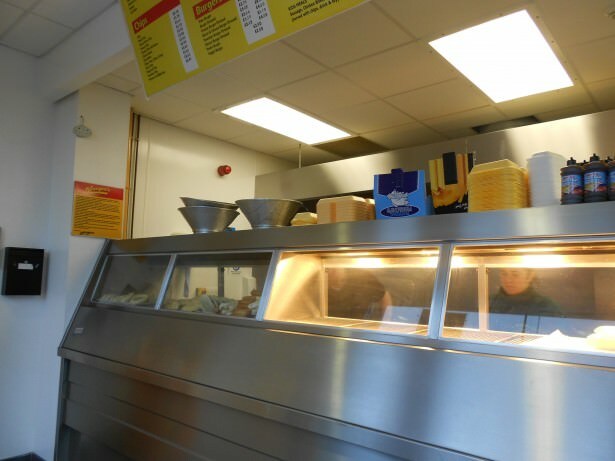 Wee Gee’s Chippy in Bangor Northern Ireland – decent spot for a pastie supper! I don’t visit my home country often these days (I’ve been back twice in four years) but on my last visit I made sure to call into the local “chippy” for a pastie supper. Before you eat one, you want to ask: WHAT’S IN A NORTHERN IRISH PASTIE SUPPER? Basically it’s minced pork, with potato, onion, herbs etc. all bundled together into an over-sized burger shape. This is then deep fried and served with chips. Salt and vinegar is a common extra. To top it all off this will come served wrapped in paper (on occasion old newspaper on the outer paper covers) and you will normally take it away. I went to Wee Gee’s on the Gransha Road in Bangor, Northern Ireland for mine. That place never even existed when I left Northern Ireland a decade ago. I was impressed to find that that good old Northern Irish pastie supper taste was still as good as ever. 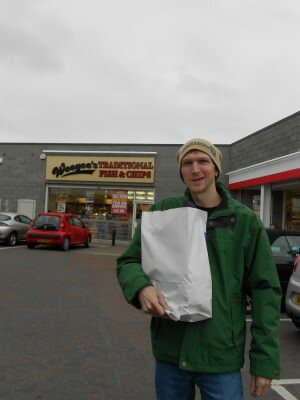 Holding a bag full of food including my Northern Irish pastie supper on a rare trip back to Bangor! 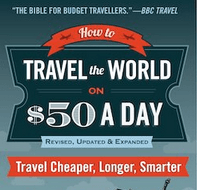 One of my favourite things about travel writing is actually telling other people about travel things they might not know about. This is a chance to do that – you may never have heard about a “pastie supper” until now so I highly recommend you visit Northern Ireland and I totally recommend you try a “pastie supper” (they’re hard to miss – almost every takeaway place in Northern Ireland will sell them, always cheap enough – a few pounds will get you a decent one with chips and a drink). On a final note, this is not to be confused with a Cornish Pasty, a product of Cornwall which they are equally proud of. Footnote – Even Wikipedia have cottoned on to the fact that a pastie supper is almost exclusively Northern Irish! Jonny Blair runs Don’t Stop Living and the Northern Irish pastie supper post is part of a regular series called Friday’s Featured Food. Jonny comes from Bangor in Northern Ireland but now lives a lifestyle of travel! This entry was posted in Bangor, Daily Features, Destinations, Destinations, Europe, Friday's Featured Food, Northern Ireland and tagged Belfast, Cornwall, Friday, Ireland, Northern England, Northern Ireland, Northern Irish, Scotland. Bookmark the permalink.